The word vicarious somehow has always been seen as a positive pleasure in sharing something with someone else while not having experienced previously the vicarious moment enjoyed. I can think of seeing my two daughters or my two granddaughters interact in a way that I have no idea what it is like. It was only recently that I was able to have a small glimpse of that when I found out I had a half-brother. On this Remembrance Day I see sepia photographs of the fathers or grandfather s of my social media friends. I see them kind of longingly but at the same time with no understanding. The only relative who had any connection with a war (and then he was really not) was my “tío postizo” Leo Mahdjubian, an Armenian who fought in the Great War in the Black Watch ( I smile at the idea of an Armenian in a kilt). My paternal grandfather Harry Waterhouse-Hayward moved from Manchester to Buenos Aires with his son and not-yet-wife Ellen Carter in 1902. By now it would be impossible for me to find out if Harry had any relatives who fought in that Great War. On my mother’s side there is my uncle Don Luís Miranda y Roxas who was a chemist for San Miguel Beer in Manila. When the “Japs” (as he called them) landed in Manila he went to sabotage the brewery plant, “To make sure the Japs don’t drink my beer.” I was too stupid to ever ask him if the Japanese found out and that is why they took over his splendid house and made it their headquarters. 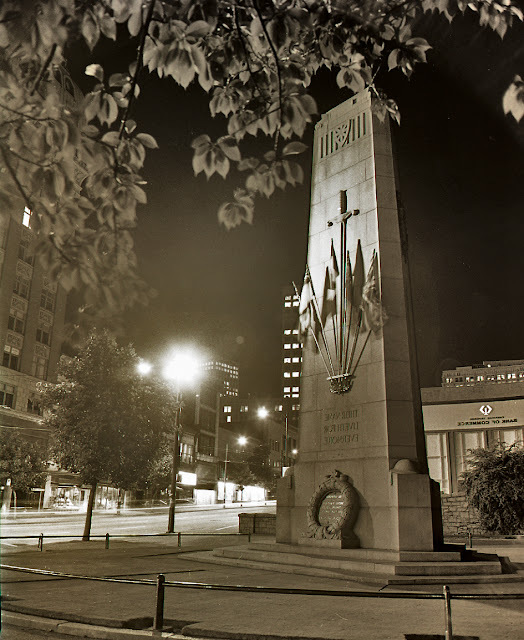 From my perch in Buenos Aires I never understood war and death except by books and films. It is because of this that I can never make myself go to the Cenotaph on VictorySquare on this Remembrance Day. I would feel like an interloper showing fake emotion and passion for people gone that I never knew. But at the same time every occasion when I read or hear “Lest we forget,” I take it personally that people in this city have a short memory for events of the very own city they live in. It was in the 80’s that I was dispatched by Vancouver Magazine to photograph at night (because the art director Chris Dahl told me so) the buildings, bridges and monuments that had been built by Thompson, Berwick, Pratt & Partners (ceased to operate in 1990) and by a precursor firm headed by Major G.L. Thornton Sharp who built the Cenotaph. The article was written by Sean Rossiter and alas we no longer have credible writing about our city architecture. It was eerie to photograph that Cenotaph at night as it was free of pedestrians. I had to put my camera on a tripod to use a technique (made irrelevant by digital cameras later) called Extended Range Night Photography. Whenever I walk by the monument I don’t see Sharp as I never met him (he died in 1974). I remember the architect that looked like an architect, Ned Pratt. I will never forget that he was the one who built what we used to call the BC Hydro Building and the now abandoned and formerly a beautiful Mondrian structure the Dal Grauer Substation.